In a large mixing bowl, combine butter and cream cheese. Beat with an electric mixer on medium to high speed for 30 seconds. Add half of of the flour, 2/3 C. sugar, 1 egg, baking powder, vanilla and almond extract; beat until combined. Beat or stir in remaining flour. Divide in half. Cover and chill for 1 to 2 hours or until firm. On a lightly floured surface, roll 1 portion of the chilled dough to a 1/4-inch thickness. Using cookie cutters, cut into desired shapes. If desired, decorate before baking. Transfer cutouts to an ungreased cookie sheet. If desired, stir together the remaining egg and oil; brush over dough and sprinkle with sugar. 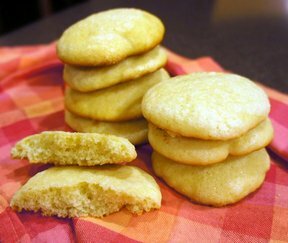 Bake in a 350° oven for 8 to 10 minutes or until edges are light brown and cookies are slightly puffed. 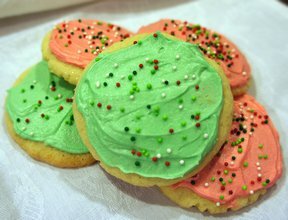 Transfer cookies to a wire rack; cool thoroughly. Makes 32 cookies.